Ubud is the most favorite tourism destination in Bali. Some of my customers says, can’t leave Bali before visiting Ubud. This is one of my Bali Tour with Mark and July (Australian) to the beautiful of Ubud Bali. it is very easy to get there from Nusa Dua , Kuta, Legian and Seminyak, just follow the bypass road of Sanur, go head to Batubulan, after passing Mas Village you will be there. Ubud traditional village well known as a culture village where easily to find the local community presenting traditional culture, temple ceremony till the traditional dance performance, that day we watched the Kecak Dance at Padang Tegal, it was gorgeous. 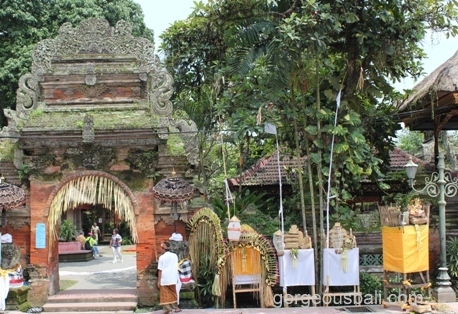 Numerous of interesting places in Ubud Bali are: Ubud Palace, Monkey Forest, and Traditional Art Market. Ubud Palace/Puri Saren, is an Ubud Kingdom Palace with beautiful Balinese traditional houses as a residence of Ubud King. As an artistic cultural life center, Puri Saren equipped with a Wantilan/auditorium that is a large building of meeting room and a banyan tree as shelter place at the daytime. Some traditional dances are usually performed here. Ubud Traditional Market, is located in the opposite Ubud Palace. This traditional market which is unfolding from west to easterly divided become two group with different purpose. The block at the west is for a traditional artistic market and the block located in the east as an everyday traditional fundamental market requirement. Ubud Traditional Market is opened every day about at 08:00 until 18:00, even some from them still open until nighttime. While traditional market for the fundamental requirement is opened everyday at 06:00 – even before that there is morning market started at 04:00 morning. July did a lot of shopping here at art market. As a cultural Village, Ubud Bali rich of history heritage of all big actors, especially all famous artists, for example I Gusti Nyoman Lempad (1862 – 1978), Anak Agng Gede Sobrat (1919 – 1992), I Gusti Made DeblogI Gusti Ketut Kobot, Ida Bagus Made, Dewa Putu Bedil, Ida Bagus Rai and others. The popularity of all above artists follows to give the inspiration to all west artists to live in Ubud Bali. In year 1920’s, two European artist people that are Rodolf Bonnet from Dutch and Walter Spies from Germany inscribe the new history of artistic growth paint the countryside of Ubud Bali. Yeah Ubud is the centre of art and culture in Bali which make our Bali Tour to Ubud package to be the most selected by our customer. Others facilities that make Ubud Bali to be a paradise for the visitors are the luxury world class hotels, villas and its several art museums. Numerous world class hotels located in Ubud area such as Pita Maha, Alila, Amandari, Four Seasons, Hanging Gardens, Waka de Uma, Kama Neka, etc. Ubud Bali is also selected as the Best Tourism City in ASIA. Congratulation.. we are very proud of this. Location; located in Ubud sub district, Gianyar Regency and about 20 km (1.20 hours drive) from Denpasar Town. Ubud Bali can be reached within 30 minutes or 15 minutes from Gianyar Town and this place is situated in the high land about 300 meter above sea level. Ubud is surrounded by the good temperature compare with other regions in Bali where the temperatures are relative cool that is ideally for everyone.